The three rates offered by CampingCard ACSI are all bargains, but you can save even more. Certain camp sites offer extra discounts to guests who stay longer than one night. 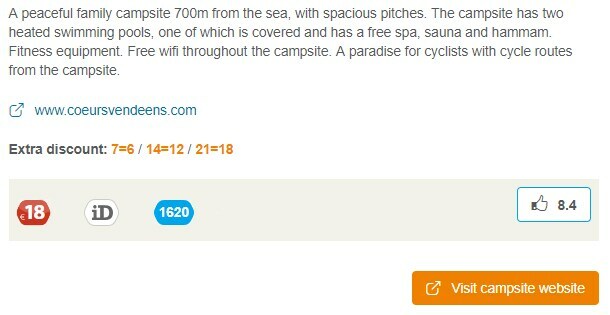 For example, a site mentioned in the guide or on this website that offers ‘7 = 6’ offers you a 7 night stay for the CampingCard ACSI rate of 6 nights. Certain camp sites may have offers which differ slightly from our examples, but on one condition – you profit more by staying longer. Please note! Where camp sites offer several different types of these offers, you only have the right to one offer. For example: the offers are 4=3, 7=6 and 14=12. If you stay for 13 nights you have the right to a single 7=6 discount and NOT to multiples of 4=3 or a combination of the two offers 4=3 and 7=6.